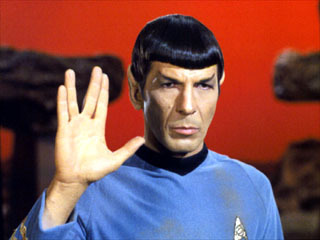 The fictional character of Mr. Spock allowed many Star Trek fans to explore their own relationship with logic and emotion. In Spock's Vulcan mindset, it was an either/or proposition: either logic or emotion. But in Change Your Thinking, the book on Cognitive Behaviour Therapy I'm reading, logic leads not to an impassive life, but instead a very happy, fulfilled life. Simply put, CBT helps you figure out what messages you're running on, and, if they're unhelpful, to change those messages. Bring them in line with reality. For instance, some people - myself included - can be really hard on themselves in social situations for saying what they perceive to be stupid or inappropriate things. So instead of looking back on, say, a networking event with happiness, I'll do a self-critical postmortem on what I should've said, shouldn't have said, etc. etc. CBT gives me a framework to 1) identify what I'm thinking, which can be quite a big step, and 2) dispute that belief using... logic! Makes sense, Sy. It’s disciplining yourself to an extent where you can recognize negative thoughts and push them away, and allow good stuff to come in to your life more and more.